Sen. Todd Young was elected on Wednesday to be the next chairman of the National Republican Senatorial Committee, a much more difficult cycle for incumbent protection on the Republican side. The Republican from Indiana was the only candidate for the post, which is being vacated by Republican Sen. Cory Gardner of Colorado. Gardner is himself in what is expected to be among the most hotly contested races of the 2020 cycle. Young and the GOP look to be on defense in at least 21 Senate seats while Democrats will be defending just a dozen, virtually the reverse scenario from 2018. Sen. Gardner’s term as NRSC chairman was marred by more than just the GOP’s mediocre results in 2018, with an embarrassing loss in Arizona and an as-yet undecided race in Florida shorting Republicans of bragging rights. The NRSC’s fundraising suffered early under Gardner’s term as GOP donors shunted their money into candidates they preferred instead of the NRSC’s first choices–which the committee scandalously tried to compensate for by poaching fundraising lists from fellow Republican campaign organizations. But for Gardner personally, lashing himself to Donald Trump in 2018 as the NRSC chairman, and joining in Trump’s conspiracy theorizing in close Senate races, just adds to Gardner’s vulnerability going into his own (presumed) re-election campaign in 2020. Running in a state that went for Hillary Clinton in 2016 and just delivered the strongest rejection of Trump possible without Trump actually being on the ballot, Gardner’s term at the NRSC saddles him with even more baggage that he brought entirely upon himself. Now he gets to explain it all to the folks at home. Corwardly heading up the NRSC was very good for Democrats, especially in Colorado. What happens now if Young proves to be not completely incompetent?? We take Cory Gardner down. I agree. 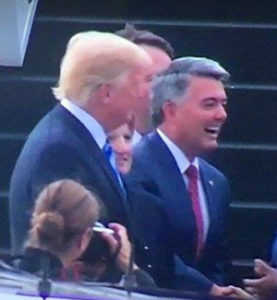 Now Smiley gets to focus 100% on Colorado. But, why is he smiling? Because he plans to cut your Social Security and Medicare. Also known as his diabolical grin.